A few weeks ago, I spent some time looking at the hand-held cabinet scraper which is nothing more or less than a blank of steel with a minute hook along each edge. That a tool so simple can work so well is still an enduring delight at the bench, but there is one glaring disadvantage. Without due care and attention it’s quite easy to scrape away at a localised area and produce a ‘dish’ which only shows up when the surface is polished. This problem can be overcome by using a scraper plane, where owing to its large sole, a flatter surface can be obtained. Both Veritas and Lie-Nielsen produce an excellent range of scraper planes and we’ve recently introduced our own Rider version of the ever popular Stanley No.80. Using one of these planes is not quite as straightforward as it seems as they can be problematic if not set up correctly, particularly the No. 85, 112 and 212 produced by Lie-Nielsen. Setting up a standard bench plane such as a No.4 isn’t too difficult; even if the blade has been inserted poorly, it can still usually be made to cut and take a shaving of sorts, but this can’t be said for a scraper plane. Tighten the blade at the wrong angle or have it set just the merest smidgen too deep and it produces a series of horrendous chatter marks on the timber, becoming almost impossible to use. The best place to start to learn how these things work is to spend ten minutes looking at the excellent Lie-Nielsen demonstration below. I’ve had a No.112 and a 212 for some years now, and didn’t bother to work out how to set them up or even to look at the video, with the consequence that it was the most frustrating experience I’d ever had with any hand tool and quite put me off using them for a long time. I made the assumption, wrongly as it turned out, that the scraper blade itself needed a turned hook as you would with a hand-held cabinet scraper. 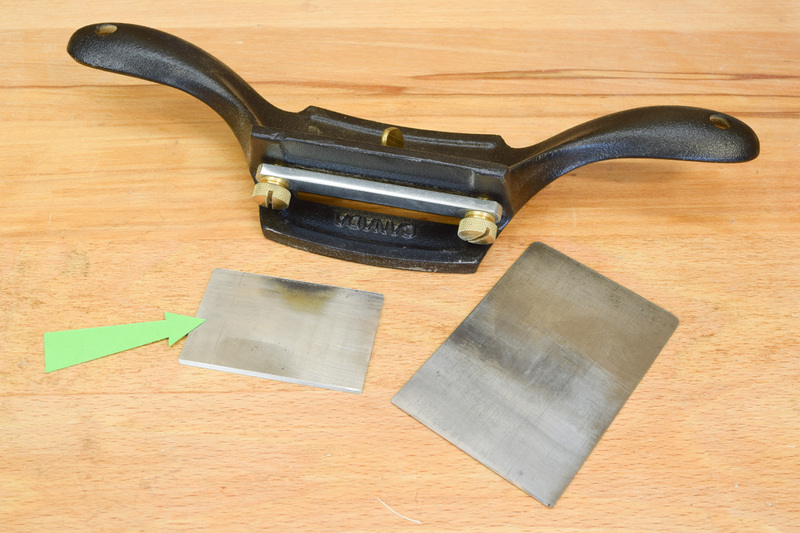 This is not to say that you can’t turn a hook on the plane blade, but if you do, it makes the tool much more sensitive to use and results, at the drop of a hat, in a vast amount of chatter. I eventually took Lie-Nielsen’s advice and set up both the scraper planes without a hook and exactly at 75° (15° from the vertical as stated). The No.112 blade will just about squeeze into an Eclipse style honing gauge, but I’ve also included a 30° ground bevel which means that once I made a projection block it became much easier to hone a very fine secondary bevel at the prescribed 45°. The square corners on the blades have also been rounded off to prevent them digging in and leaving a set of tram lines all across the work. Veritas produce their slightly different version of the No.80 which they call a Cabinet Scraper and also a large Scraping Plane. Both of these planes rely on a different system to set the depth of cut. Whereas Lie-Nielsen use slight finger pressure on top of the blade, Veritas employ a turn screw to bow the blade slightly where it projects below the sole, which makes it much easier to use. One of the big problems with the No. 80 style scraper planes is that the blades are too small. The blade as supplied (arrowed) doesn’t leave much of an allowance when it’s inserted into the honing guide and it’s all but impossible to fit it into the Tormek SE-77 jig. My solution to this problem was to discard the original blade and then find an old, much longer and fairly thick cabinet scraper blade which was about the right size. This was now large enough to fit the Tormek jig to grind the 30° bevel and also made it much easier to sharpen the secondary bevel in the honing guide. 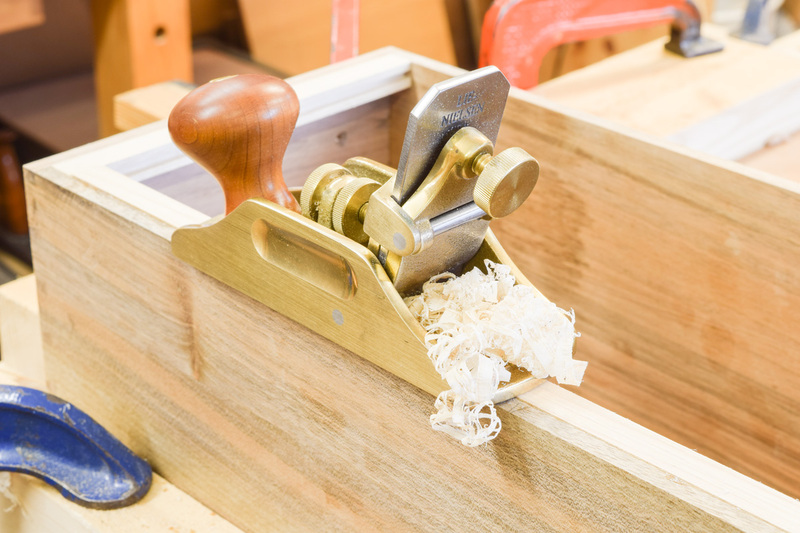 When they’re correctly honed and fitted, all my scraper planes now take very fine, wispy shavings off the most difficult timber and, where they were once a complete chore to set up and use, they’re now a pleasure. The current project in the workshop is a large chest of drawers using American hickory for the centre runner and drawer slips. This stuff is pretty hard and machines very well, but I’ve found it impossible to hand plane, despite setting up my Veritas Bevel Up Smoother with a high pitched blade and close mouth. Hickory will, however, scrape beautifully. There’s a definite learning curve to master the scraper plane, especially the ones made by Lie-Nielsen, but once you do get the hang of them, you’ll find them indispensable.